which it is gradually replacing from the museums of Spain. from these collections, as well as from loan exhibits. 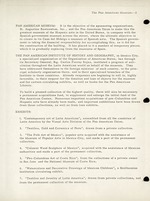 Latin America by the Visual Arts Division of the Pan American Union. Z. "Textiles, Gold and Ceramics of Peru", drawn from a private collection. authorities and made a part of the permanent collection. in San Jose and the National Museum of Costa Rica. from the permanent collection of the museum. in the building for changing exhibits. Bureau of Internal Revenue to receive tax exempt gifts.